Are you a freshman at college this year? Make sure to check out my Freshman’s Guide to College series for everything you need to know about that first year! Or are you in a later year and just love to get organized? Make sure to check out these 10 tips to stay organized in college to help you stay productive! Syllabus week is one of my favourite weeks of the entire school year. And no, not just because there aren’t any papers due yet. I love that I get a whole week to just get to know your classmates, skim over the material for the year, and talk to professors while still in a relaxed setting (more like the calm before the storm). From my experience, starting off your year at college on the right foot is the best way to guarantee academic success. There are 5 things that I do every semester that really help me get organized and prepare myself for a great semester, and I thought that today I’d share them with you! This is the perfect opportunity to make a few friends! The classes start late to help kids who get lost and end super early. Plus, no one has made their little clique of friends for that class yet! So introduce yourself to the three or so people who are sitting around you and see where it takes you! Making friends in college is easy if you take advantage of the opportunities in front of you! This one I cannot stress enough: your syllabus is your Bible for that class, and it’s so important to have on you at all times. It has the location of your class and the times, so if you forget if your class is at 10 or 11:30 it’ll have the answer! But that won’t help you much if it’s sitting on your desk at home, so keep it in your binder at all times. Also, you will not believe how many times I’ve gone to the very first class and had to change some of the information on the syllabus because it was written incorrectly. First class. You’re also likely to encounter changes with due dates or material covered throughout the semester, so if you want to get organized this year and stay that way you had better make sure to have your syllabus on you at all times. Of course, just having a physical copy of the syllabus on you will make no difference if you don’t actually read it. We don’t learn by osmosis, as awesome as that would be. As you read your syllabus, add in the due dates, midterms, and important deadlines into your planner now so that you don’t get caught unprepared later! I’ve already got all of my deadlines in my planner and classes don’t start until the 8th for me, because my classes all released the course outline about a week ago. Without fail every semester someone in class tries to make the excuse that they didn’t understand when the due dates were so they should be able to have an extension. Please, don’t be that kid. Just read the darn thing, it’ll take you 20 minutes, and then you’ll know exactly what’s ahead of you! Related: The 10 BEST Study Tips for College Students! You don’t want to miss these! Now that you know where your classes are, as well as approximately how much work they will require (because you were a good student and read your syllabus inside and out), you can figure out how to schedule all of your non-classroom time. How much time do you want to dedicate to working out? How much time will you need to get your studying done for each class? Can you afford to section off 8 hours a week for your Christian fellowship group? Or only 3? Figure out what works for you and schedule your time accordingly. If you act preemptively and schedule out your time now, before classes really pick up, you won’t have to spend as much time playing catch-up later in the semester. And trust me, that’ll help you come exam time. This may seem like a strange thing to do, since it’s only the first week of class, but now is the time to do it! Professors are the perfect networking opportunity. It’s great to build a good rapport with them before you come to them asking for help. Just drop by their office hours and let them know that you’re looking forward to taking their class. Ask them any questions that you may have in the future, such as if they have specific study tips for exams. (Note: don’t ask what material you should study. Ask how to study. Big difference.) If you’re hoping to go into the same field of study that they work in, let them know and just discuss what it’s like to work in that area! You want your professor to know you as more than just a grade. This week is the perfect week to start! What do you do during syllabus week to put you ahead the rest of the year? 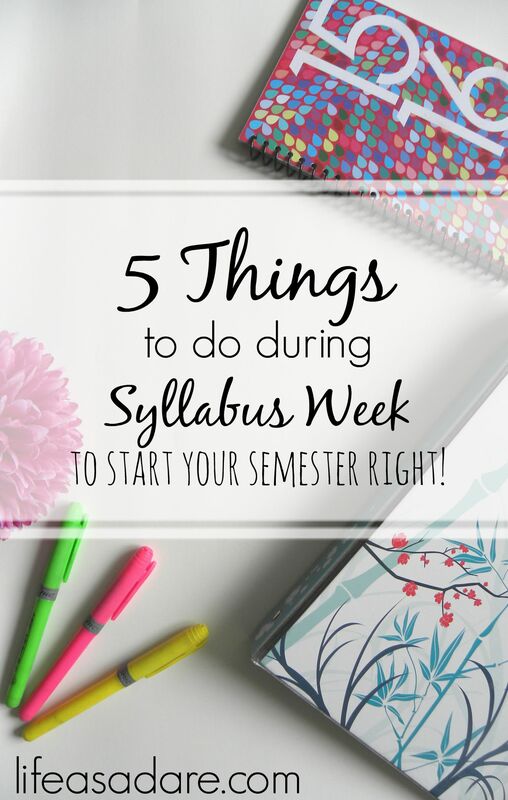 Great tips, totally agree that your syllabus is SO important! I’m glad you liked it! :) All the best with your new adventure!! add dates to your agenda! I also color code my agenda for each of my classes so I know what I’m doing for each class. Such a good idea – I am an organized freak & never thought of this! We don’t have “syllabus week” in the UK, instead we have a thing called freshers week or week one, that includes all of our introductory lectures and things! I love taking the information from the syllabus and organising it into my own sheet, then I can make it look pretty and I only have the information that is actually useful! Yeah we don’t have “syllabus week” in Canada, either, we call it “welcome week” (because we’re Canadians, and so of course it would be welcoming…). But most of my readers are American so I use their term for it! Oh that’s a good idea! I know that some profs have really short syllabuses (syllabi?) but I had one that was 27 pages once. Crazy. I might try your way this year!